Adidas Supernova Sequence 4 - To Buy or Not in Apr 2019? The Adidas Supernova Sequence 4 offers improvements to the previous Supernova Sequence model. It’s a little bit more flexible underfoot and fits much better than its predecessor. But ultimately this shoe is for heavy runners looking to help with. This isn’t a low-level stability shoe. It offers a lot of hard support and nearly classifies as a motion control shoe. The shoe is also slightly heavier than the previous Supernova Sequence. It’s a great option if you’re looking for a lot of firm stability as well as comfort. If the weight of the shoe doesn’t bother you much, then the Supernova Sequence 4 might just be your shoe of choice. Not suitable for wet conditions. The outsole of the Adidas Supernova Sequence 4 is made of adiWEAR. It's a rubber outsole that is made to last. It's highly concentrated in high wear areas. The forefoot also features blown rubber which enhances traction and ensures that the runner doesn't slip and slide in wet conditions. There aren't any glaring changes that have been made to the Supernova Sequence 4. The outsole remains the same as the previous iteration of the shoe. It remains durable and solid in construction. FORMOTION tech is featured in the heel of the Supernova Sequence 4 this technology allows for increased efficiency of movement. FORMOTION tech means that the heel is separated from the rest of the shoe. It makes this shoe perfect for different types of surfaces. Since the heel moves independently, when ground level is uneven, a runner's foot isn't twisted every which way. It allows for a greater range of motion throughout the run. The Adidas Supernova Sequence 4 features full-length adiPRENE cushioning. It makes for a nice cushioned run. This cushioning technology is also durable so it won't feel flat after a few runs. The forefoot contains adiPRENE+ cushioning which enables runners to have a more efficient toe-off. The midsole also features EVA foam which acts to provide a durable cushion for long-lasting comfort. The midsole also contains the Pro-moderator medial post which helps to counteract excessive overpronation. The Torsion System reappears in this Supernova Sequence model as well. This system allows the front and back of a runner's foot to move separately which increases the shoe's stability. The fit of the Adidas Supernova Sequence 4 is greatly improved. The upper fits more snugly without constricting the foot thanks to its GEOFIT construction. GEOFIT is a memory foam that allows a better fit in the heel area. There isn't the same forward slippage as with the previous model. The toe box offers enough room to wiggle around so runners will likely find the shoe's fit much more comfortable. The inside of the shoe also includes the standard EVA sock liner which can be removed should you wish to run with custom orthotics. The Adidas Supernova Sequence 4 shoe is actually heavier than the previous iteration. Definitely not a welcome change for an already bulky shoe. When the shoe is wet, the weight goes up even more. The mesh upper does allow for some breathability but some runners commented that the shoe became waterlogged in wet, rainy conditions. Pair that with the already heavy construction and you're sure to feel like you're running with a brick hanging off your foot. If you're living in an area where rain-soaked runs are common, the Supernova Sequence 4 might not be the best option for a daily trainer. The Adidas Supernova Sequence 4 has a mesh upper which enhances breathability and ensures adequate temperature control. Again, there are few changes in terms of breathability in this Supernova Sequence model. The shoe features the same mesh upper and breathability remains similar from model to model. There are no improvements here in terms of the mesh. The shoe does fit a bit more snugly than the previous model though, so some runners might find they need to size up a bit. Some runners commented that the fit was too tight and the shoe felt uncomfortably hot while on a run. Some runners also commented that this heat buildups contributed to blisters forming on their heels. As with any shoe, it's always a good idea to ensure fit before buying. Check with your local running store to see if you can try out a pair for a period of time before committing. The improved fit of the Adidas Supernova Sequence 4 has pleased many runners. Most wearers have commented that they feel the shoe fits just right. This is in great part due to the better fitting upper. There is much less constriction and pressure on a runner's foot since the toe box is roomier. The shoe is also very comfortable thanks to its full-length adiPRENE cushioning. The forefoot features adiPRENE+ cushioning making for a soft feeling when toeing off. The adiPRENE+ cushioning is found the entire length of the forefoot making for an exceptionally comfortable toe-off. The cushion is ample in both the heel and forefoot and runners will feel nicely padded underfoot throughout their runs. The Adidas Supernova Sequence 4s bring a bit more style to the mix. Adidas has introduced a pop of color in the Sequence 4s. This shoe isn't going to work as a replacement for your casual sneakers when heading out for brunch post-run. They still look very gym-like and won't effortlessly blend into your casual outfit. But the pop of color makes for a nice change. The women's version includes a nice pairing of orange and purple on a nearly all-white base. It's a definite improvement in style from the previous Supernova Sequence version. Pops of color add interest and personality to a previously bland looking shoe. The Adidas Supernova Sequence 4 is a fairly durable shoe and should see you through several hundred miles of running on whatever surface you choose. Many runners commented that they found the shoe to last 600 or more miles. That's a substantial amount of mileage and makes the higher price tag worth it. The cushioning is also durable and won't fall flat after a while of use. Runners commented that they felt the cushioning felt fresh and soft throughout the life of the shoe. The adiWEAR rubber technology of the outsole is the same as the previous model and delivers a lasting construction that will carry runners through many miles. The Adidas Supernova Sequence 4 is a substantial shoe and the durable construction will keep runners feet protected from the elements. The shoe is breathable, so wet conditions won't dampen your enjoyment on the run. You'll also find reflective features to keep you protected in low-light conditions. Your shoes should not be your only saving grace, however. On dark evening runs, make sure you're also wearing additional reflective gear or wearing lights to make sure you're seen by traffic. The best part about the Adidas Supernova Sequence 4? The ample amount of shock absorption in the form of adiPRENE cushioning. The shoe also does an outstanding job in protecting runners from overpronation. Runners who need good support will find it in the Supernova Sequence 4. The Adidas Supernova Sequence 4 is a tad bit more responsive than the previous iteration of the shoe. But it still remains fairly inflexible. It's a very rigid shoe that doesn't offer a lot of ground feedback. 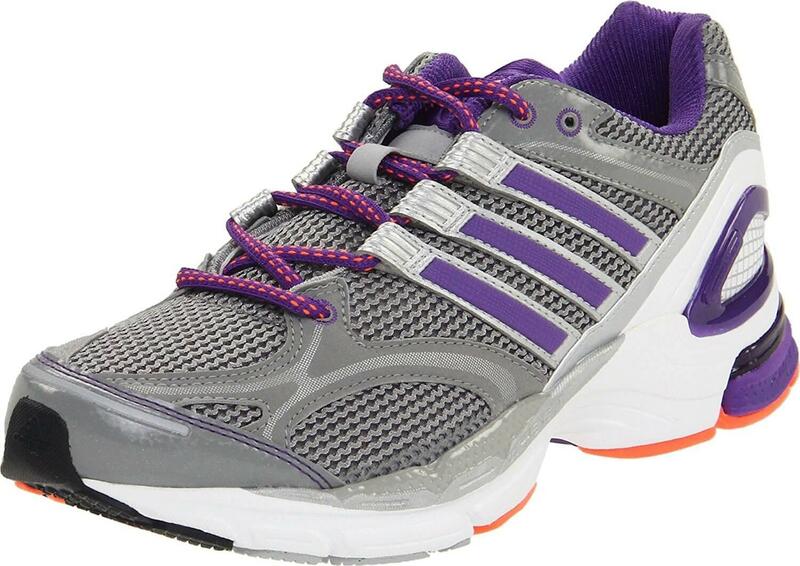 There's ample cushioning to help avoid excessive shock on joints, but there's little energy return with each footfall. If you're seeking a shoe that provides you with feedback with each step, look elsewhere. Still, quite a few runners commented that the Supernova Sequence 4 was markedly improved from the previous version of the shoe. The increased responsiveness was a welcome change, but it's still a far cry from other shoe models. The rigid construction of the Adidas Supernova Sequence 4 allows for a great support base. You won't feel floppy while running in this shoe. You get a nice stable support base that will allow you to avoid excessive overpronation thanks to the Pro-moderator Plus medial post. There is also a good amount of arch support in the midfoot. The Torsion System also gives runners support and allows for the front and back of the shoe and foot to move independently. This eliminates unwanted forces from twisting the shoe and foot and helps to avoid injury. The Adidas Supernova Sequence 4 is not a trail shoe but if you're so inclined to test out some off-road routes, you should feel comfortable and supported in the Supernova Sequence 4. The shoe should take you through trails quite comfortably. You won't feel the ground too much in these, so highly technical trails are best left for another day. The price of the Adidas Supernova Sequence 4 is reasonable and comparable to other similar high stability models on the market. The fact that this shoe will last for several hundred miles makes the price tag worth it. It will definitely do the job that it promises to do which is to offer excellent support and protection for overpronators. It's definitely a solidly constructed shoe. The standard rubber outsole provides good traction in the Adidas Supernova Sequence 4. There's nothing fancy going on, but you won't be slipping and sliding all over the place on your runs. There aren't many changes to the outsole so you'll feel similarly stable in wet conditions as you might have felt in the previous version of the shoe. The adiWEAR rubber will ensure that you are in control underfoot and that whatever surface you're running on, you'll be able to run for several hundred miles in the Supernova Sequence 4. The Adidas Supernova Sequence 4 is much more flexible than its predecessor and does a better job of allowing the wearer to move freely with each stride. The heel is built to move independently from the rest of the shoe so movement is a bit freer. But ultimately, the shoe is still rigid. If you are a runner that prefers a more natural ride, you'll want to avoid the Supernova Sequence 4. The Adidas Supernova Sequence 4 borders on falling into the motion control category. It's heavy and offers excellent stability and support. The ample stability comes at a price, though, since the shoe is heavier than its predecessor. Still, for runners who need the support, this is a perfect option. The shoe is quite bulky, but it's also very comfortable underfoot. If you're not an excessive overpronator though, look elsewhere. You'll definitely find the shoe a bit cumbersome and heavy. The heel to toe drop in the Adidas Supernova Sequence 4 is 12.2mm. There isn't going to be good ground feel if you choose this shoe, but the support is superb. The drop is similar to the previous iteration, so if you're used to wearing the previous Supernova Sequence, there's no change here. It's a significant drop so it's clear that this shoe is aimed towards heel strikers. Still, the shoe doesn't forget other runners completely. The adiPRENE+ forefoot cushioning ensures a soft forefoot landing and the whole length of the shoe is cushioned adequately to ensure a comfortable ride. If you're a heavier runner who overpronates excessively, the Adidas Supernova Sequence 4 is a great option. Be aware that you'll be getting a heavy shoe with this model, but the amount of support and stability is nearly unbeatable. You won't be sacrificing comfort thankfully since the shoe includes a nicely cushioned midsole to absorb shock from pounding the pavement. If you're injury prone and still want to find a way to enjoy your runs, the Supernova Sequence 4 might be a good option. It's definitely a good daily trainer if you meet the criteria mentioned. This is a workhorse of a shoe that does its job to keep runners stable and supported. It's a good update to the series since it fits much more comfortable and offers even more stability.